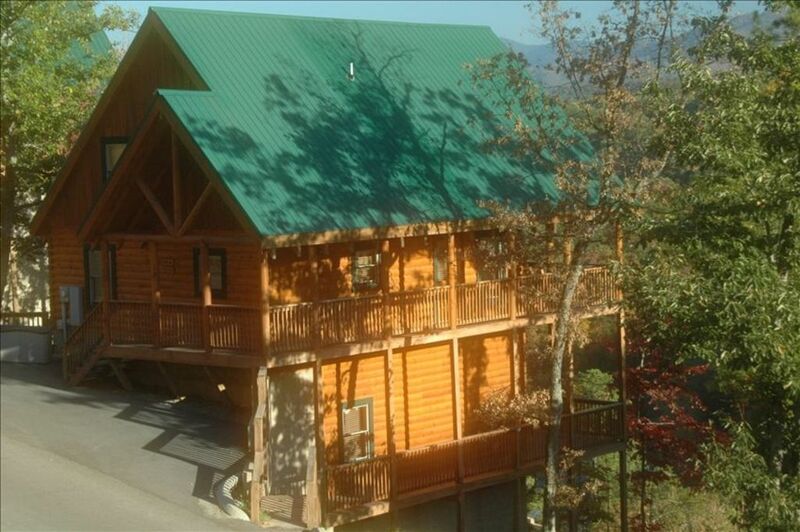 Fresh Air Cabin is a beautiful, luxury 4 Bedroom Cabin with an INCREDIBLE View. You are going to love your stay in this cabin. This luxury cabin is located in the beautiful Sherwood Forest Resort. Enjoy the ultimate vacation experience both inside and out. Not only is the view and cabin a luxury in itself, it is a perfect place to unwind, enjoy quiet nights and fun filled days. Take a deep breath, relax and enjoy your stay. The resort has a large pool within a short walk of the Fresh Air Cabin. The cabin has four bedrooms. One on the main floor with a King Bed, one upstairs with a King Bed and two downstairs each with queen beds. The cabin also has two living rooms; each with a pull out hide-a-bed couch. We really enjoyed our stay. Great cabin and location. Would have benefited from towels for hot tub but a great place to stay overall! Thank you for the nice review. We are glad you had a nice time and look forward to your next visit. We loved the cabin. Very close to town. Only issues was , on rainy stay in days. we could use more TV. The largest was in game room (basement). Only 1 on any bedroom. This was the master upstairs . This was very very small. Overall though all was great. We had a great time at the cabin. The surrounding areas of Pigeon Forge, Gatlinburg and Obergatlinburg are just a short drive with lots of activities to enjoy. The cabin is laid out really nice and is family friendly with lots of space, a cozy living room, good size kitchen and GREAT porches!! We enjoyed sitting in the rockers on the porch listening to the birds in the early mornings. So relaxing! The cabin could use more towels and some extra blankets for those chilly nights. The Resort is building new cabins so there is construction noise going on, but thankfully they don't start too early in the morning and they finish around supper time so the evenings were quiet. The cabin was clean and comfortable! Although close to other cabins and the city, we still had wonderful views and felt secluded. Definitely recommend! Absolutely loved the view from the cabin. Very clean and well kept. I have already recommended this cabin to another friend. We will definitely be staying there again when we decide to take another trip to Tennessee! Highly recommend! DIRECTIONS: Turn onto Conner Heights Road at Light # 10 -- Continue about 1/2 mile and Turn Left on Rush Branch Road --- Continue to Sherwood Forest Resort and Look for the First Gate on the Right -- Enter Gate Code on Keypad at the First Gate. About Deposits: Please treat our cabin the same way you would treat your own home. If you leave the cabin in good condition your deposit will be returned 14 days after your stay. Should we need to keep your deposit we will provide you with pictures and documentation. Thank you for your consideration.